Paul calls the believers in Philippi to keep their eyes on those who walk (conduct their lives) in the light of the grace of God and focus their attention on Jesus. They will live a certain kind of life. The most important characteristics that you should look for is evidence of the Holy Spirit. That’s seen in the fruits of the Spirit as Paul records them in Galatians. The first three are really obvious in people. They are love, joy and peace! People that live their lives loving God and loving others have joy filled lives. Those whose lives are filled with love and joy live in peace with God and with others. One might not think that Paul lived in peace with others because of the constant attacks on him. But that would be to misunderstand Paul. Jesus also was actually the “Prince of Peace” but he had many enemies also. Paul tells us in Romans to be at peace with all men as far as it depends on us. It wasn’t Paul or Jesus who disturbed the peace. It was those who hated them and the Gospel message. 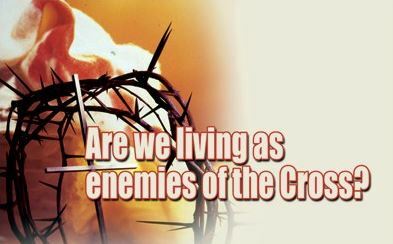 “Enemies of the cross of Christ” is a fascinating term and is often misunderstood. In the Old Testament, especially in the book of Psalms, as well as in much early Jewish literature the enemies of God’s people were referred to frequently as goyim, or dogs! Paul intentionally turned this phrase on the legalists. He said that they were the true “dogs” (Philippians 3:2). The major controversy in the entire early church as seen in the book of Acts as well as most of the epistles is the role of “law” in a Christian’s salvation. Paul finds it essential to continually repeat his message of salvation by grace through faith alone. To Paul, Jesus paid it all on the cross of Calvary. Enemies of the cross are those who continually try to add something to the free gift of salvation through faith! Anyone who adds a ritual, a custom, a performance or a sacrifice to the cross as a necessity for salvation becomes an enemy of the Cross. Jesus either paid it all, or he paid none! This understanding assures that God alone gets the glory!